If you'll indulge me, dear reader, I'd like to share with you another hobby of mine: studying plant life. I love plants – don't you? I have to admit though that I'm… not good… at caring for them. So, rather than watch my houseplants die, now I have fun by learning about, and recognizing, species around me in the great, outside world. Studying plant life isn't wildly popular, as you may have noticed. Plants don't evoke the attention and excitement that, say, animals do. Although I'm fascinated by them, sometimes even I find it difficult to pay attention to them in my surroundings, as I'm so accustomed to viewing plant life as undifferentiated "nature" or as a kind of visual background noise sprinkled throughout the urban landscape. Studying and identifying plants is actually fun, but there is a high barrier to entry. Starting out is overwhelming because, well, there are so many trees and shrubs and flowers and grasses everywhere, and a lot of them look the same, plus they're all kind of mixed-in with each other – so where does one begin? And when does the fun start? 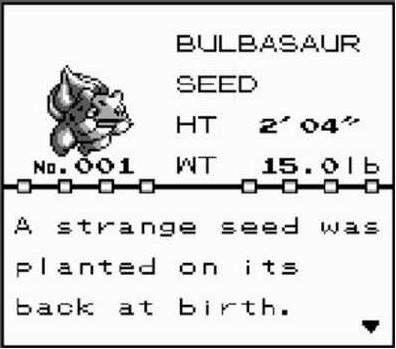 Welcome to Project Bulbasaur Botany! On occasion, and in addition to writing humor, I'll be sharing short, fun lessons about a variety of plant types and species, including plants common in ornamental landscaping, featuring our pokémon friend and teacher, Bulbasaur. Can you identify the plant type pictured above?